FRA MV40 Relay Team . "Shaun Godsman has just phoned again. It is the Gold medals from the relays we need to return and NOT the champs medals. I think it will be the guys who shot off straight after prize giving who will have the wrong ones. Please check the writing on the back because the bronze and gold are very similar in colour. Can all gold medals be returned to Mike Robinson, I will be at the Duddon Race. If you have a gold medal in your possession please make sure that it makes it way to me at Duddon. You can contact me on 0778301640 or 07712321666. A quick response will be much appreciated, Mike." Jura:- "After the men's record having an upgrade last year, it was time for the ladies this time around, with Jasmin improving Angela Mudge's Jura record by 1min50sec, to a new best of 3:38:43." 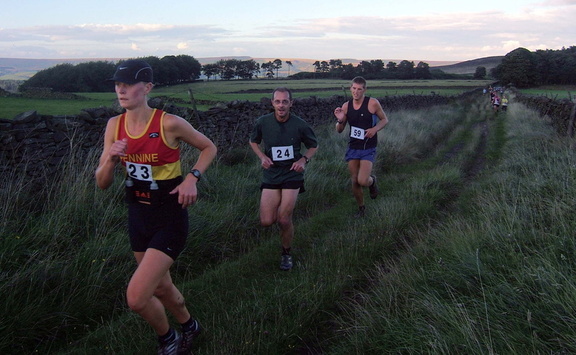 Full results here and Dark Peak results in the usual place. Looks like a storming run from Neil, and good runs from Kirsty and Penny. Helvellyn and the Dodds:- results. Shutlingsloe:- an almost full Barnett turnout here. results. Ingleton Scenery:- results. Dicky Wilkinson "was the only brown vest as I was staying in Lancaster after Jura and before Duddon. Legs were still bruised from Jura so struggled a bit even though I managed 2nd V50 / 1st V55 - outward stretch along a river a lot of concrete and wooden edged steps then a trail run over tracks to a return river and more steps to a final road stretch - well organised, low key and friendly." DT - this is the trail of Ingleton Waterfalls, a most scenic trip round, though not quite needing full studs..